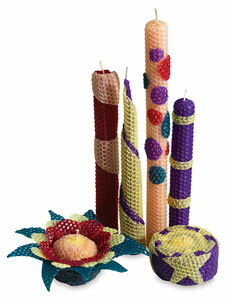 Beeswax candlemaking is fun for everyone, especially kids. Every Yaley's Beeswax Kit contains two 8" × 16" sheets of pure 100% beeswax from California beehives, three feet of bleached wicking material, and complete, easy-to-follow instructions. ™ Yaley is a trademark.